The first entry in this pattern book numbered 25 is dated the 25th July 1926. Collectors should appreciate that during the period covered by this website, an increasing use was made of printed outlines which were then enamelled by hand, often not by the artist named. Women were employed as enamellers and they were not at this time permitted to sign their own work, although this practice eventually changed in the post war period. Instead generic names such as “Ellis” and “Garnett” were used, and the base of the piece was merely marked with an initial or other cipher for quality control purposes. In this section, and in the following pages, I have referred to work by the male artists Dean, Gresley, Chivers and Hague etc. but there is no guarantee that they actually decorated the object. 9646 – Dessert plate in the Talbot shape with flower centre by Cuthbert Gresley. I have also seen an example initialled R.B. (Robert Barratt) with a date code for 1927. 9647 - Similar to 9646 but with yellow ground and unsigned flower sprays. 9649 - Shape unidentified. Maroon ground with printed gold pattern. Plain centre. 9677 – Plate in the Ellesmere shape with Ellis centre. 9680 – Silver shape with unsigned flower centre. 9684 – Dragon pattern with a Hot Water jug in the Dublin shape. Cauldon also produced a version of this pattern. 9719 - My representation of this pattern which is on the Talbot shape with yellow ground and Ellis Centre. The thick gold band and diamond shape panels are acid etched. I have seen these as a set of 12 with date cipher for 1929 and marked "W H Plummer and Co. Ltd. New York". 9723 – Vase decorated by Dean. Shape number 1016. John Twitchett and Betty Bailey list the shape numbers but there are very few illustrations. 1016 is described as follows: “Vase, plain, with embossed neck and top, and two small handles L 7.25 in. S 5.75 in.” 9735 – Gadroon shape with green ground to shoulder and centre signed “E. Ellis”. 9736 Talbot shape teacup and saucer with maroon ground panels, ivory ground and raised gold flowers. 9738 - My representation of this pattern which is on the Talbot shape with maroon ground to rim. 974? - The last number is missing. Gadroon shape, green ground, gold printed pattern below shoulder and ellis centre. 9747 – Tray 1685 oval shape. 9756 – Ely/Chelsea shape. A version of 9781 (see below), but with pink and purple enamel. 9762 – Gadroon shape. Green enamel to embossment and band at shoulder. Bird centre. Signed “E. Ellis”. 9765 - Talbot shape-plate. Blue enamel to the embossment. This version has a Dean centre. 9766 – Talbot shape plate. Green enamel to the embossment which is hand gilt with edge and two lines. Line at shoulder. 9777 – Gadroon shape with cobalt ground to rim. Gold printed pattern over ground. Dean centre (untitled). 9781 – Edinburgh shape coffee cup and saucer. A version of 9756 but predominantly blue coloured. 9795 – Gadroon shape. Yellow ground to embossment and band at shoulder. Crescent shape centre flower spray signed “E. Ellis”. 9801 – Similar to 9777 but with different gold printed pattern over ground. Dean centre. The scene is untitled. 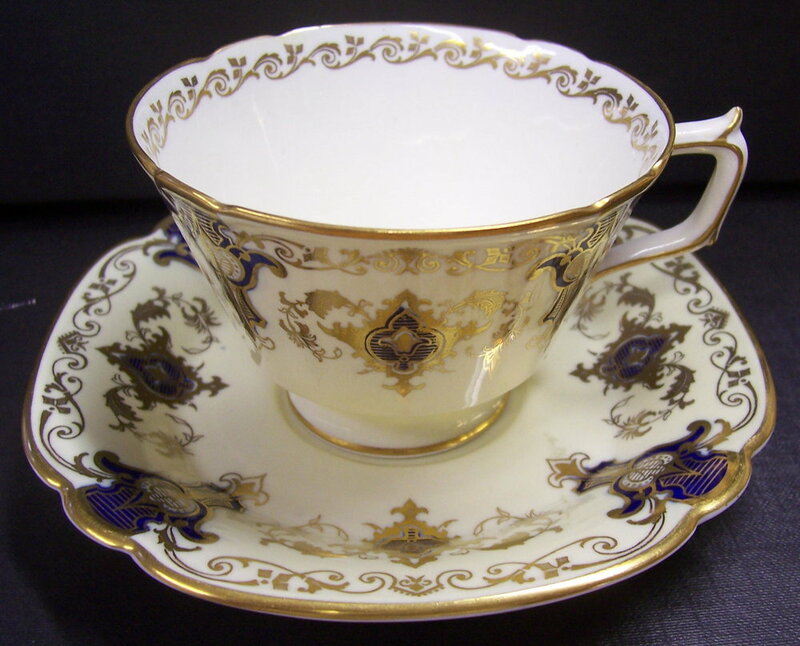 9803 – Talbot shape teacup and saucer with ivory ground all over. Similar to 9766 but with the green enamel extending over part of the rim. 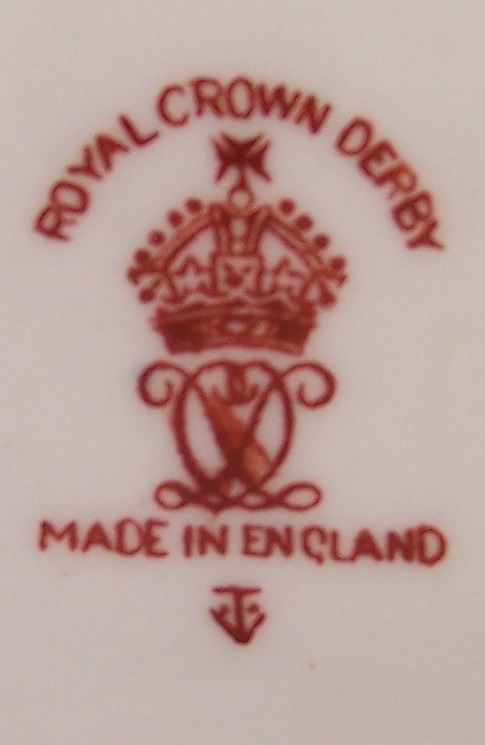 A plate in the red enamel version bearing the same pattern number is also included. 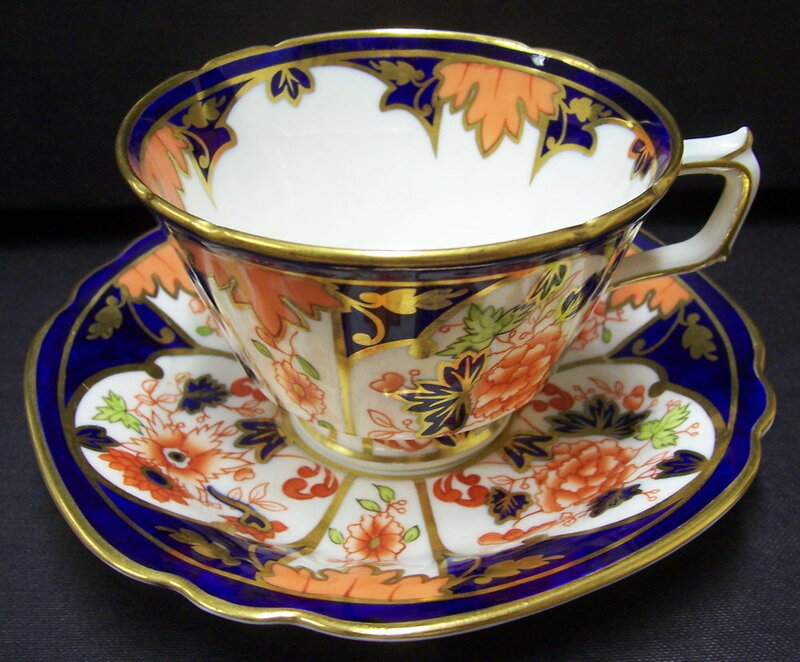 9810 – Square Chelsea shape cup and saucer. Cobalt ground with pattern hand gilt and enamelled in orange and light green. Thick gold edge and inner line. Traced gold handle. The gilding on this set is of an exceptional quality. 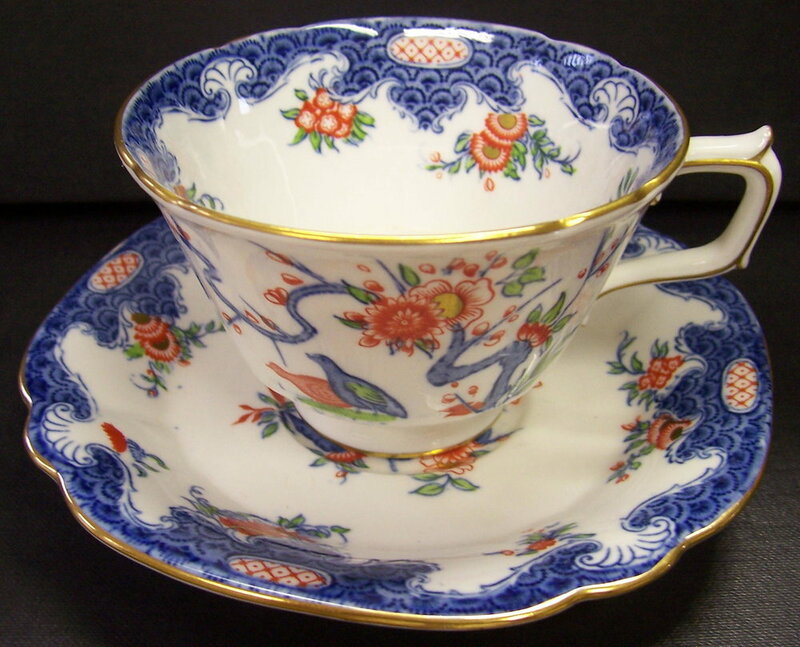 9812 – Square Chelsea shape teacup and saucer. Blue printed pattern with enamelling by hand. Gilt edge and foot line. Traced handle. 9814 - Gadroon shape with cobalt ground to rim. Unsigned but inscribed on the reverse "After Paul Sandby. The Father of British Water-Colour Art 1728-1809". 9815 – A green version of 9812. 9816 – A light blue version of 9812. 9818 – Square Chelsea shape teacup and saucer. Cobalt ground. A variation of the "Melton" pattern (Pattern number 2649) also called “Barbed Wire” because of the gilt four point “bows” which are a particular feature. Thick gold edge and heavily gilt handle, thin foot line and inner line below rim. A good range of miniatures were also produced in this pattern including a miniature tea set with teapot, milk, sugar and two teacups and saucers. 9838 – Plain shape I believe with a printed pattern hand enamelled in red and orange. Narrow bands of maroon, cobalt and orange grounds at the edge, shoulder and around the inner panel, gilt over by hand. Remarkable workmanship. 9841 “Portman Oak” – Plain shape I believe. I presume the pattern was printed, but the acorns, thick gold edge, shoulder line, and more particularly the hatched irregular band, all appear to be applied by hand. 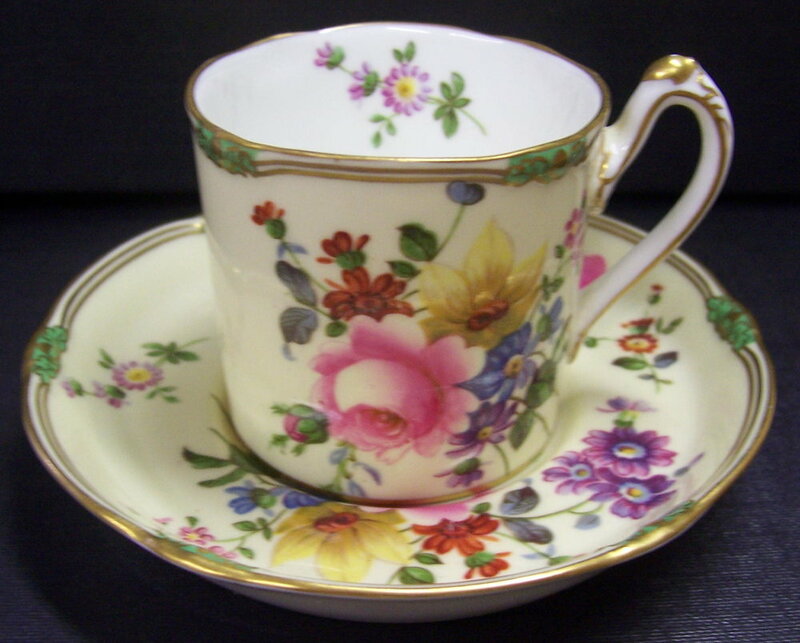 9864 “Balmoral” – Teacup and saucer in the talbot shape. Green ground and painted flower centre. This set is unsigned. This version of 9864 Balmoral has a centre painted with fruit by Gresley. 9874 - My representation of this pattern which appears on the Dublin shape. Thick gold edge and fine line. Handle gilt as shown in the image. 9875 Posie blue Line is the first example of the posie spray in its litho form, a pattern which remains in production today. 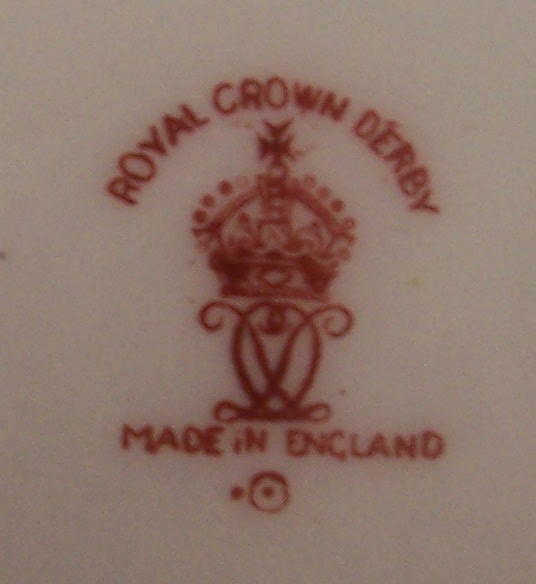 It also appears on Caulden ware in several versions including one called "Marita" Whilst the main part of the posie pattern was applied as a litho or transfer, the roses were hand painted, making each piece slightly different. It appears here in the Square Chelsea shape. Remarkably this pattern is still in production today. 9881 - A coffee cup and saucer in the Surrey shape. Printed gold pattern. Edge gilt by hand. Solid gold handle. 9876 is a version of posie in the Talbot shape. As 9766 but with the addition of the posie sprays. 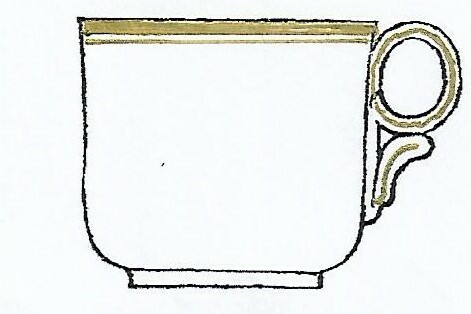 9888 – Coffee Cup and saucer in the Dover shape. Ivory ground all over with printed pattern in gold. Gold edge and traced handle. The second image shows a boxed presentation coffee set in this pattern complete with silver spoons made for Hardy Bros. Jewellers and Silversmiths Australia. 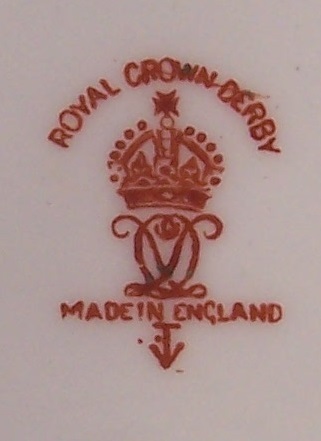 9907 – A sugar bowl in the surrey shape. Printed gold pattern similar to pattern 9881. 9917 – Square Chelsea shape teacups and saucers. This pattern appears in green, cobalt and maroon ground versions and all are marked with the same pattern number. Thick gold edge, thin foot line and traced handle. 9918 – Talbot shape plate with green ground, gold printed pattern and “Garnett” centre. Hand gilt edge, and embossment with two lines. 9925 – As 9918 but with “Ellis” centre. 9926 – As 9918 but with maroon ground. 9921 - My representation of this pattern. Talbot shape plate with green ground to rim, printed gold border below the shoulder and Ellis centre. Seen as a set of eight with factory mark for 1932. 9928 – Clarence shape plate with green ground to rim overprinted with a gold pattern which extends below the shoulder. Hand gilt edge, shoulder line and embossment. “Ellis” centre. 9943 – Old Chelsea Sweet shape dish with rural scene by Dean. 9944 – Tray shape 1803 with Dean maritime centre. Sold together with its original box. 9956 –Tray shape 1375 (Card Basket Oval on four small feet) with green ground and centre by Gresley. 9957 - Tray 1685 oval shape with green ground and Gresley centre. 9961 - A covered box (Shape number 1784) signed by Dean with a depiction of "Dorothy Vernon's Bridge" an image taken from illustrations by Ernest Haslehust within a guide book entitled "The Peak District" by R. Murray Gilchrist. 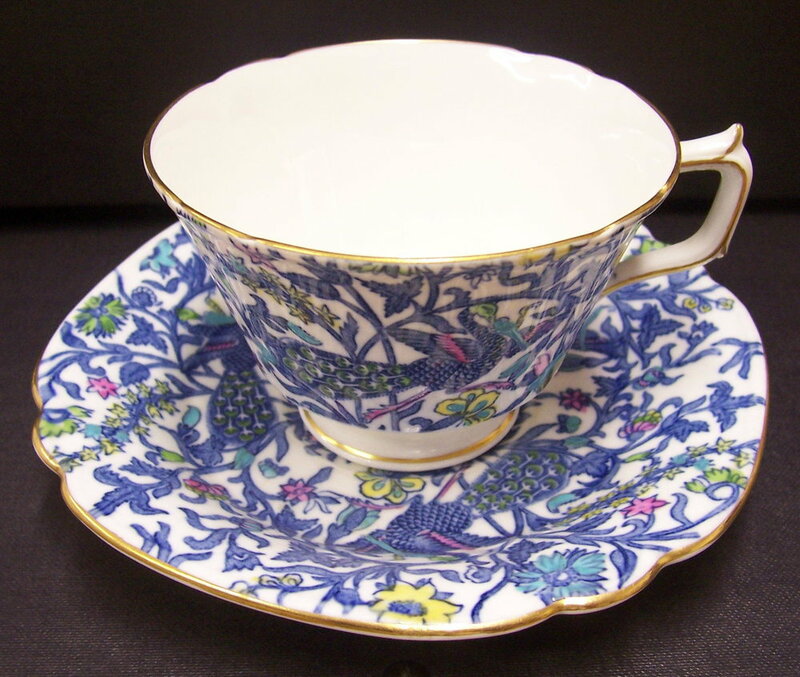 9971 – Square Chelsea shape teacup and saucer in a pattern apparently referred to as “Peacock and Worm”. Pattern printed in blue and then hand enamelled in pink, green, yellow and turquoise. Gold edge and foot line. Traced handle. 9973 - Saucer in unknown shape. 9987 – Plain shape I believe. Cobalt ground border to edge overlaid with hand applied gold swirls. Printed inner border extending to shoulder in red. Gold edge. 9988 – Similar to 9987 but in the Dover shape with the pattern printed in blue and the flowers hand enamelled in red. 9990 – Unknown shape, perhaps mostyn, with green ground extending over the shoulder and litho posie centre. Gold edge and inner line. 9991 – Similar to 9990. Here in the Edinburgh shape with posie spray inside cup. Gold edge, shoulder line and foot line. Traced handle. The following are dated from 1927 onwards but have no marked pattern number. They may be re-issues of old patterns, but further research is required.